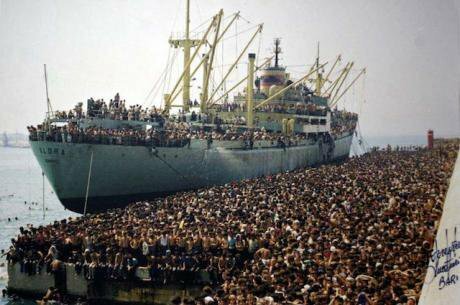 Albanian refugees from the Vlora in the Port of Bari (Italy) on 8 August 1991. Wikicommons/ Luca Turi. Some rights reserved. Felicita Tramontana (FT): Nowadays, the issue of migration is high on the political agenda, European governments come under pressure to restrict the entry of asylum-seekers and the terms “migrants” and “refugees” fill television commentaries and our social networks. As an expert on migration history what aspects of the current debate have you found most striking? Leo Lucassen (LL): What strikes me most is the alarmist verging on apocalyptic fears that you find now in both public and political debate. This is striking because many people do not realize that if you compare the number of refugees coming to the EU in the 2010s with those coming in the 1990s, the numbers back then were considerably higher than they are now. If you compare the number of refugees coming to the EU in the 2010s with those coming in the 1990s, the numbers back then were considerably higher than they are now. The same applies to assumptions about the origins of asylum seekers. Some people would say that in 1999 refugees were coming from Europe, from Yugoslavia, say. Well, that is in part true: but back then, the bulk of the refugees were coming from the same regions as they are now, within the Middle East – not Syria which was at peace, but Iran, Iraq, Afghanistan – and also from the Horne of Africa, back then it was Somalia, now it is Eritrea. Thirdly, if you look at how the refugees who arrived in the 1990s have been integrated – from the Netherlands we have detailed research that has closely followed people through time – and these people do not constitute a problem in our society. Given the circumstances, they integrated not at all badly. So as a historian, that makes you wonder – as I find myself wondering regularly – what has changed? As a historian, that makes you wonder – as I find myself wondering regularly – what has changed? If it is not the numbers, if it is not the place of origin, if it is not a case of not having yet properly ‘digested’ these refugees from the 1990s, how can we explain the alarmist tones in current political debate on refugees? There are some obvious factors worth mentioning that help to explain this change. There is of course 9/11 and the association of Islam and Muslims with terror, which makes people much more afraid. Back then Islam was not a dominant theme, and it had not been turned into an electoral issue either, at least in Dutch politics. Nor was this the case in Germany, for example, which had much higher numbers in the 1990s than they do now. So we have to see 9/11 as a game-changer, together of course with what happened afterwards in London, Madrid, Brussels, Nice and Paris, leading to the rise of Islamophobia. Back then Islam was not a dominant theme, and it had not been turned into an electoral issue either, at least in Dutch politics. This is one major aspect that has changed: but this fear could only have been mobilised so dramatically as a result of the rise of populist parties that were almost non-existent in the 1990s. There was of course the old Le Pen’s Front National, but at that time it was a marginal force. Now in other countries as well we have radical-right parties, in the Netherlands, but also in Denmark, and the Front National under Marine Le Pen has become much stronger, attracting considerable numbers of votes in the French presidential election. These parties are very good at mobilizing fears and using these asylum seekers as scapegoats for any social ill that they wish to highlight, giving easy answers to natives who are unemployed, who have lost social benefits or who are simply afraid of the effects of globalisation. A third element that is new is social media. Social media can be used to mobilize both fears and solidarity, but what we see, what we all know, is that it facilitates the constant pumping around of all kinds of fake news about refugees and Muslims on a large scale. These media lead to the formation of a more segmented information stream that targets different parts of the population. I think that 20 years ago people did share more ‘normal’ and objective news than they do now. Although people have always lived in (politically or religiously determined) bubbles, nowadays these have become more narrow, and more politicized. Social media have played an important role in this change. Social media facilitates the constant pumping around of all kinds of fake news about refugees and Muslims on a large scale. The fourth factor is that migration has become much more visible. This is not only in the case of the asylum seekers, but also in the case of people coming to Europe, especially from Sub-Saharan Africa. This visibility is a consequence of the fact that they are more or less forced to embark on very irregular and dangerous journeys, especially by boat over the Mediterranean. This was not entirely absent in the 1990s; as an Italian you of course will remember the boats from Albania in the early 1990s. But it was largely limited to the Adriatic Sea. Back then, there were also border deaths, and people drowning in the Mediterranean, but the phenomenon only became very visible after 2010. The reason for this, firstly, is the change that has taken place in EU visa policy. In 1993, for the first time, an EU visa regime was introduced that made it obligatory to acquire a visa in your passport to legally enter an EU country. At the beginning, this change had little effect in terms of visibility, because there were a lot of alternative ways to enter Europe. The ‘iron curtain’ in Eastern Europe had just dropped and it was very easy to cross borders in the east, in Turkey, Bulgaria, Poland. So most of the irregular entries in the 1990s came in over land and it was only very gradually that the number of people taking boats increased. In the early 2000s the number of arrivals decreased because of a temporarily quieter and more stable situation in Iraq and Afghanistan, especially when the US forces went in. Initially that led to hope. But of course in the longer run we all know that it led to the implosion of Iraq. Even though the numbers were still quite small, initially, those who did come tended already to be more dependent on traffickers with boats, resulting in a rise in the number of border deaths already at the beginning of the twenty-first century. Then, in 2011, the numbers rose again and by then land borders had become much more difficult to cross, which resulted in a massive run to use boats, especially from Turkey to the Greek islands in the Eastern Mediterranean. And that makes these arrivals much more visible and much more frightening, with the general perception being that migration is out of control and that millions of people are on the verge of entering the EU. We know that this is not the case: but this again is another difference with the 1990s. And then there is a fifth factor that affects contemporary debate, which is the way the whole discussion regarding refugees is mixed up with the discussion about the integration of former foreign workers, especially from Algeria for France, from Morocco for the Netherlands and Belgium, from Turkey for Germany, etc. Under this heading, as a migration historian, I think it is important to note the consequences with respect to family reunification for these groups. These workers, initially, only thought to stay for a short period. From 1973 onwards, however, because of the oil price shocks and the start of the recession, all the countries that had recruited guest workers decided to end these programmes and close the borders. This had the opposite effect, because it conveyed the message to the guest workers that if they left then, they would never be able to get in again. Therefore they started using those social (welfare state) and legal (residential, family reunification) rights that they had built up, to bring their families over. We can now see in retrospect that bringing over family members with the aim of settling occurred at a rather unfortunate moment, as we argued in a recent article in the Journal of Modern History. The moment was wrong because it was the beginning of a recession and these people worked in sectors such as textiles and metals, that closed their gates due to the global competition coming from South and East Asia. This resulted then in turn in a mass settlement of people who had been selected for their low skills, many of whom soon after the arrival of their families lost their jobs. As a consequence, they could only find housing in the worst parts of European cities, including the banlieues of Paris and Lyon. That was the moment when their integration process should have started, but – with the benefit of hindsight – we can conclude that this was bound to lead to all kinds of social (and cultural) problems. This was unavoidable. This unexpected immigration led to what you could call a sort of ‘guest workers’ trauma’ in the minds of politicians, and policy makers, but also parts of the population. It also resulted in the association of migration with social problems and cultural problems, especially – and again that is what we explain in our article, The Strange Death Of Dutch Tolerance – after the Rushdie affair when, in the Netherlands and in other European countries, the publication and dissemination of Salman Rushdie’s Satanic Verses (1988) led to demonstrations on the part of Muslim citizens demanding that the book should be banned. It became obvious that a section of these guest workers and their children were developing intolerant ideas on freedom of speech and the rights of women and gay people. These are not problems that are insuperable, nor are they exclusively to be found among immigrants. But they have been framed very much as problems inherent in the nature of both Islam and immigrants, who are not yet as enlightened as the natives. These really-existing frictions and problems, as well as the anti-immigrant framing, plays an important role in current discussions about asylum seekers. And this is unfortunate because, as research on the asylum seekers in the 1990s has shown, guest workers and refugees are to a large extent quite different groups, especially when it comes to human capital and religious behaviour. Moreover, many descendants of Muslim migrant labourers are much better integrated than people realize. Many descendants of Muslim migrant labourers are much better integrated than people realize. These factors taken together have resulted in a very toxic mix of interlinked sources of tension, in comparison with the 1990s. And this mix is the main reason why people panic about the arrival of refugees. There may also be a sixth factor: the fear of the third world coming to us, because of the huge gaps between rich and poor, but also because of climate change, often mentioned as something that will cause millions and millions of African and South Asians to flock to Europe. This, on top of other things, leads to the widespread opinion that, even though in principle many people think one should help refugees, if they are not stopped, Europe will be inundated. FT: Over the centuries Europeans themselves have been migrants, moving within the continent or, for example, to America or Australia. Despite this, how can you explain the total lack of historical consciousness that seems to characterize European society? LL: Yes, this is true and it is partly explained by the ideology of the nation-state that we inherited from the nineteenth century and that is deeply ingrained in our cultural DNA. According to such a nationalist ideology, inhabitants of a nation state are supposed to share the same language, religion and to be ethnically homogenous. Nation-state foundational ideology presupposes, more or less, that the bulk of the population never moves and that immigration must pose a problem. It follows that in an ideal world people should stay put, and that if outsiders move in from another country they must be assimilated as soon as possible. One of the consequences of this ideology of the nation-state, is that there is no real awareness of the diversity of ‘native’ populations. One of the consequences of this ideology of the nation-state, is that there is no real awareness of the diversity of ‘native’ populations. In most countries you only have to go back one, two or three generations for a large proportion of people to have migration backgrounds. In the Netherlands, if you look back a few generations, 90% of the population have a migration background. In other countries the percentage might be lower, as is the case in the UK (with the exception of the Irish immigrants in the nineteenth century). But what is interesting about the UK is that so many British people became migrants within their imperial colonial circle. They are what I refer to as “organizational migrants”, as their migration was prompted by the organizations that they joined: such as the army, companies, the government or churches. The driver of the British taxi I took here from the airport, for example, was in Korea and in Egypt with the army. FT: Doesn’t this raise questions about the very definition of ‘migration’ in contemporary debate? LL: Indeed it does. One of the main problems regarding the debate about migration is that it tends to be defined in a very narrow and myopic way. I mean, to most people ‘migrants’ are men and women who come from very different countries and cultures, and who settle permanently, despite having limited to low skills. This is also why we have developed such categories as ‘expats’ and ‘western migrants’, in order to exclude them from the ‘real’ (and allegedly problematic) migrants. By consequence, we rarely discuss migration as such: we often don´t even perceive a large part of the actual migration flows, and this further reproduces the ‘immigration as a problem’ frame. We have developed such categories as ‘expats’ and ‘western migrants’, in order to exclude them from the ‘real’ (and allegedly problematic) migrants. FT: In this framework, can a knowledge of the past widen our understanding of ‘migration’? LL: In the last 10-15 years, together with my brother Jan – who is also a historian – we have developed an approach inspired by new concepts in world history and global history. Together we have introduced a very different typology of migration that is not so dominated by the nation-state definition, and that includes both internal and temporary movements of people. The theoretical approach that we took – which we called “cross cultural migration” – is grounded in the idea that national borders do not constitute the only cultural border. If you go back in time, for example, to early modern Europe, political borders were much less important. Other kinds of borders were much more relevant from the cultural point of view. We distinguish therefore four kinds of migration: one is migration between the countryside and cities, because they were very distinct worlds. Differences between living in nearby villages as opposed to the city could well have been great, despite the short journey from one to the other. Entering the city meant leaving a face-to-face and family-dominated society behind to enter a much more anonymous place run by institutions. The second border is crossed by people moving to a very different ecological setting, from one land to another, especially as part of a colonial relationship. A third type of migration is represented by seasonal migrations. For a long time, well into the nineteenth century, many people made an annual pilgrimage from very autarchic regions, such as mountains and islands, to highly commercialized ones, taking back all kinds of new ideas and capital. Finally, the fourth category is represented by the already mentioned “organizational migrants”. To sum up, if we want to discuss what migration is and what it does to societies, we should take a much broader perspective and not let ourselves reproduce the very limited problem-oriented definition of migration prompted by the nation-state ideology, an ideology which is of course also reproduced in statistics. FT: In your article “The Strange Death of Dutch Tolerance” you explore the reasons underlying the change in Dutch attitudes toward migration, arguing that the timing of this change (2000) is due to the evaporation of a ‘political correctness’ linked to the ethical revolution of the 1960s and 1970s, and guilt feelings regarding the deportation of the Jews. These factors had shaped the political debate in previous decades. But the Netherlands is not alone in experiencing a new attitude toward migration over the last two decades. I am thinking in particular about Denmark, but other northern European countries seem to have followed the same path. Do you think we will come to regard the tolerant and constructive attitude towards migration that characterized the last three decades of the last century as an aberration? LL: That is difficult to say, we are in the middle of this period and for a proper historical analysis we need more of a temporal distance. But yes, at the moment that is how it looks. However there are also counter forces. If you look at the Netherlands for example, the populist party – VVD, Volkspartij voor Vrijheid en Democratie [People's Party for Freedom and Democracy] – still mobilises only 16% of the electorate. And in France, Macron shows that you can also be successful with a pro-European political agenda. I think we should not underestimate the resilience of society and also the yearning of many people for a more optimistic message. The German AfD is not doing so well, notwithstanding the fact that we now live in a period of Islamist terrorism. So it is not inconceivable that in the coming years we will see a counterforce becoming more dominant. Even in Germany this AFD [Alternative für Deutschland] is not doing so well, notwithstanding the fact that we now live in a period of Islamist terrorism. How things develop will largely depend on the extent to which politicians are able and willing to mobilize their electorate in a different way and to convey a more positive and inclusive message. We will have to see, but I am not overly pessimistic. FT: Might Trump and Brexit have a positive effect on European politics in the end, if only by helping the development of these “counter forces”? Well, from this point of view, the election of Donald Trump also has positive effects as it shows to many Europeans what happens when you elect extreme populists in government! Actually it might have contributed to the drop experienced by the populist party in the Netherlands in the polls over recent months. As far as Brexit is concerned it is less clear what the longterm effects will be.